Wondering what it means to dream about an aquarium? An aquarium is a habitat for fish, frogs, and other underwater life. If you see an aquarium in your dreams, understanding the symbolism can help you understand what is currently happening in your life. Water in the aquarium symbolizes your emotions. Water in dreams almost always symbolizes feelings and emotions. If the aquarium is well maintained and the water is clean you may feel that your emotions are in check and that you are calm, cool and collected. However if the water appears to be dirty or murky you may be feeling bogged down in waking life with too many expectations from yourself and others and you do not have a good emotional outlet to cope with this pressure. You may also be having difficulty setting boundaries with others and their demands on you are making you feel trapped. This dream is a warning that if you do not begin setting healthy boundaries with others, you may start to feel like you are in a toxic environment. To see fish in an aquarium in your dream represents life and movement. This could mean that you may need to take an important trip or journey, especially if you dream of fish swimming from one side to another. Frogs are often symbols of communication. Dreaming of a frog inside of an aquarium can mean that you need to communicate your feelings about something, especially when surrounded by water. See frog dream meaning for additional insight. To see yourself in an aquarium in your dream represents that you might feel like you are on display for others. You may be worried that people talking behind your back. You may also feel like you are trapped or that you do not have control of your emotions. You may feel like you are being limited by something in your life. To see yourself purchasing an aquarium in your dream can possibly mean that you will be undertaking a large project that might require an emotional investment. You may also be trying to consider possible choices and options for your feelings on what to do with your life. See shopping dream meaning for additional resources for what it means to buy something in a dream. To see selling an aquarium in your dream suggests that you will help someone who is currently struggling financially or emotionally. This person whom you will help will mention you favorably to others in the future. If you were buying or selling an aquarium and gain or spend money, you may want to think about the amount of energy you are investing in your emotions and your current environment in waking life. Understanding money as a symbol for energy can be helpful to understanding more about your dreams. Also, pay attention to the numbers involved in the prices of the dream. Sometimes these numbers can provide additional insight. To see a little aquarium in your dream symbolizes small issues within your household and you will find a way to resolve these problems with the help of a person outside your household. You may feel like your feelings are insignificant or are not being validated by others. A big aquarium suggests that your problems with your family members will vanish as soon as possible as a result of your own efforts and your household ties will strengthen more. To see that an aquarium is broken or blown up in your dream symbolizes that you will occupy the same environment with people whom you don't like. This most often portends to a work environment. 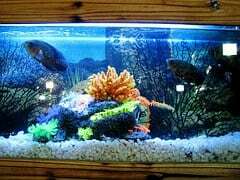 To see a lot of numerous types of fish in an aquarium in your dream may represent that you will resolve the problems with individuals not by confronting them, but rather by improving yourself. What are your thoughts on dreams about an aquarium? Share your experiences in a the comments below. I have had a dream where the water of the aquarium extends outside where the glass is and the fish can swim out and in freely. I can reach into the water to touch the fish and the water does not collapse. I need some help! I’ve been dreaming about fish tanks for years. Literally probably weekly for 10 years. Never dirty or cracked. Its always about buying larger aquariums, moving fish around to the bigger spots, sometimes about larger fish eating others because of displacement.